The i.MX RT1020 expands the i.MX RT crossover processor families by providing high-performance feature set in low-cost LQFP packages, further simplifying board design and layout for customers. The i.MX RT1020 runs on the Arm® Cortex®-M7 core at 500 MHz. The MIMXRT1020 SoC has five pairs of pinmux/gpio controllers. 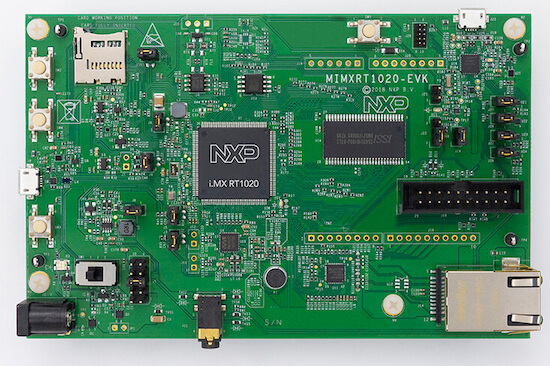 The MIMXRT1020 SoC is configured to use the 24 MHz external oscillator on the board with the on-chip PLL to generate a 500 MHz core clock. The MIMXRT1020 SoC has eight UARTs. LPUART1 is configured for the console, LPUART2 for the Bluetooth Host Controller Interface (BT HCI), and the remaining are not used. Follow the instructions in OpenSDA J-Link Onboard Debug Probe to program the OpenSDA J-Link MIMXRT1020-EVK Firmware. Check that jumpers J27 and J28 are on (they are on by default when boards ship from the factory) to ensure SWD signals are connected to the OpenSDA microcontroller. Attach a J-Link 20-pin connector to J16. Check that jumpers J27 and J28 are off (they are on by default when boards ship from the factory) to ensure SWD signals are disconnected from the OpenSDA microcontroller. Regardless of your choice in debug probe, we will use the OpenSDA microcontroller as a usb-to-serial adapter for the serial console. Check that jumpers J25 and J26 are on (they are on by default when boards ship from the factory) to connect UART signals to the OpenSDA microcontroller. Connect a USB cable from your PC to J23.